ALL VESSELS ON MOORINGS AND BERTHS WITHIN THE HARBOUR, WHETHER PRIVATE OR MAINTAINED, ARE SUBJECT TO HARBOUR DUES AND MUST OBTAIN INSURANCE AGAINST THIRD PARTY CLAIMS FOR AT LEAST THE MINIMUM SUM RECOMMENDED BY LEADING MARINE INSURERS. NB: A 20% non-refundable deposit is required each November to reserve the mooring for a season which starts on 01 April and ends on 31 March the following year, the balance of the mooring fee and harbour dues is required by the 14 March preceeding the season. For further information please see our Conditions of Hire for a Conservancy maintained mooring and our Conditions of Use for our dinghy chain facilities. Should you have any specific queries please do not hesitate to contact Ed Carter, Moorings Officer on 01243 510980, email ed.carter@conservancy.co.uk or submit a Mooring Application Form to enquire about a suitable vacancy for your vessel. 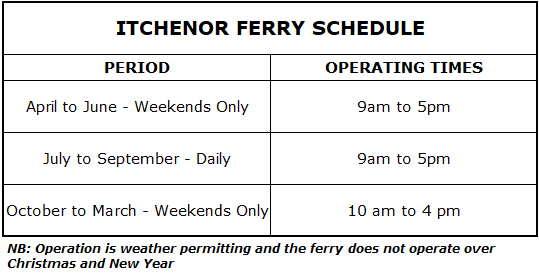 The Itchenor Ferry is now running throughout the year, please see the below schedule. You can contact the ferry on VHF 08 or by calling 07970 378350. Please click here for further information. The jetty at Itchenor has fresh water available (you will need to provide your own hose) and a grey water pump-out facility is also available for those boats with holding tanks. Boats may use the jetty for picking up stores and passengers for a period up to 20 mins; this is a very busy jetty during the summer months. Two sets of scrubbing piles are available on the Hard ( £18 per workable low tide) these each have piped fresh water, the western set of piles also can be served by electricity from an adjacent power point (you will need approx 100m extension lead). Showers are available at The Harbour Office, Itchenor, tokens are £1.50 each and can be bought from the Office, Patrol Staff or the ferryman. The Conservancy maintains over 380 swinging moorings in this busy hub of the Harbour, the deepwater moorings here are accessible at all states of the tide. We are able to accommodate vessels of all types on swinging moorings in the Reach in the areas on the plot. Dinghy storage is available on the public hard at Itchenor. Situated at the eastern end of the Itchenor Reach, mooring holders in this beautiful area are able to make use of the boathouse and tender storage at Westlands. Here you can keep a rigid tender on the dinghy chains or an inflatable tender in the racks and have access to the secure boathouse, with toilet facilities, where you can store an outboard engine and use a locker (provide your own padlock). Parking for vehicles is provided with a 'permit only' car park. These facilities provide easy use of these moorings with a maintained shingle causeway to the low water mark alongwith two dinghy trolleys to assist customers in launching their tenders. This location offers good access from the nearby Northney Marina; please contact the Marina for launching fees on 02392 466321. Deep water moorings in this area are highly sought after, subsequently vacancies are rare. Click here for moorings map and information. Good access from Northney Marina area or tidal access from Langstone village. NB: The Marina will charge for launching a tender from the marina, this includes car parking. If you wish to keep the tender in the Marina compound there is an additional charge. A small Rithe that runs NW from the western end of Sweare Deep. Access is possible from Northney Marina; please contact the Marina for launching fees - 02392 466321. Access is also possible from the village of Langstone, although more restricted by the tide. 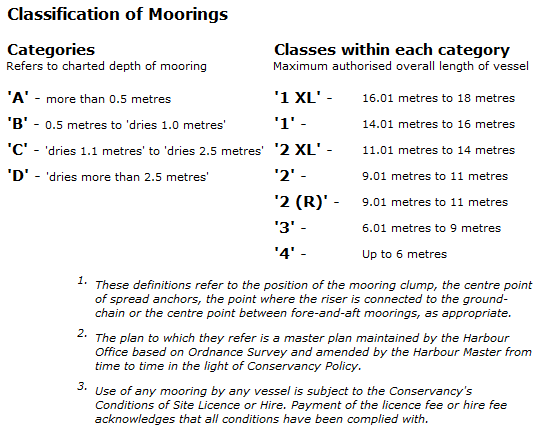 The moorings are laid in a single line of 13 in number B3 moorings, and 8 in number C3 moorings. These moorings are ideally placed for sailing from this part of the harbour. A complimentary ferry for Conservancy mooring hirers operates +/- 2hrs either side of HW on Fri/Sat/Sun and Bank Holidays from I April - 30 Sept. Operating times are 2hrs either side of HW, between the 0830 - 1700. Full Tide - Deepwater Moorings: Emsworth Channel offers good deepwater moorings for boats up to 12m & 9m. These moorings offer good access to the harbour and the eastern Solent. Dinghies may be kept on the Conservancy hard adjacent to the South Street slipway or by the pontoon on the sea wall, from where the complimentary ferry operates. ¾ tide Moorings: These moorings offer full tide access during the neap tide cycle but will dry for a short period during the spring tides. The moorings offer a good alternative for those boats that can take the ground with the benefit of access during the neaps. NB: Havant Borough Council offer seasonal ticket options, call 0300 555 0705 for details. These C3 moorings lying just south of Emsworth town offer a good half tide facility for boats up to 9m, drying on to soft mud with easy access +/- 3 hrs either side of HW. Dinghies may be kept on the Conservancy hard adjacent to the South Street slipway or by the pontoon on the sea wall, from where the complimentary ferry operates. The C3 moorings at Girt Rithe offer half tide moorings at a 33% reduction in the standard rate, due to the restricted access +/- 2 hrs either side of HW. Dinghies may be kept on the Conservancy hard at Nore Barn, these are available free of charge. Car parking in this area is limited to on street parking. Access to mooring from dinghy chains at Prinsted Point +/- 3hrs either side of HW. Access from Thornham Marina +/- 2 hrs either side of HW. For customers that use Thornham marina for access the current annual charge levied by the marina is £100 for use of the car park and facilities. *There are a small number of class 2 moorings suitable for shallow draft vessels over 9m at the north eastern end of the channel which are ideal for multihull boats. The moorings in Bosham are owned by Burhill Golf and Leisure Limited, for whom Chichester Harbour Conservancy manages the letting and maintenance of the moorings and the management of the quayside and facilities. The payment of the mooring fee is made directly to Burhill. The letting period for moorings in the Bosham Channel is from 01 April to 31 October. Winter mooring can be arranged at a reduced rate but is only available to customers that hire a summer season mooring. Burhill prefer that the mooring hire payment is made by Direct Debit agreement and payments are taken annually, in full, on or around 01 April. For payments made by Direct Debit there is no admin fee. You can download a copy of the Direct Debit agreement form here. Burhill do not accept payments by debit or credit card and any annual payments made by cheque or bank transfer incur a £25.00 administration fee. To make an enquiry, or to apply for a mooring in the Bosham Channel please contact the Moorings Officer Ed Carter on 01243 510980 or email ed.carter@conservancy.co.uk. 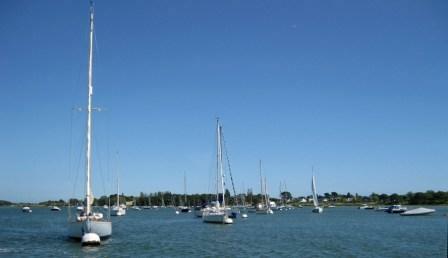 The quay at Bosham hosts many facilities for vessel owners, both resident and visitor alike. A concrete pad provides drying hard standing for the scrubbing of vessels and a jetwash machine is available for hire. The slipway provides launching access for all times except low spring tides and there are spaces to keep smaller vessels and tenders at the slipway, on the quay or in a secure boat store. Please see below for the applicable charges. The quay office is manned during season (01 April to 30 September) by the quay master Chris Green. He can be contacted on the office number 01243 573336. Please contact the quay office to book if you wish to berth alongside the quay, use the concrete scrudding pad, hire the jetwash or to pay quay fees including launching, alongside berthing and small vessel storage. Please see the full list of quay dues and services charges for more information. Read our short Guide to Using a Swinging Mooring to make sure your boat is moored safely and securely. For general advice on laying drying moorings, please see our handy guide. To discuss the various options, locations and prices please contact the Moorings Officer, Ed Carter on 01243 510980 or email ed.carter@conservancy.co.uk.